So, you've decided not to go for the Penney's elf-jumper but you still don't quite know what to get those last few awkward people for Christmas. 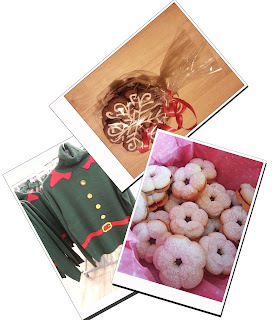 Why not try a food gift? Everyone eats so how far wrong can you go? I am using gingerbread gifts instead of Christmas cards this year as they involve a bit more thought and are infinitely more useful than some tacky image of a Dickensian street-scape gathering dust on the mantelpiece. 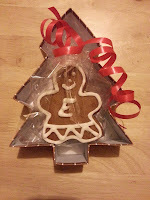 This is not my own gingerbread recipe though, I used a great one from The Pink Whisk. With half-price Christmas cookie-cutters from Homestore and More combined with some great Christmas tree shaped gift boxes from Ikea, I had some great looking gingerbread gifts in no time. I am also going to use my Mini Jammie Dodgers for both food gifts and as Petit Fours on Christmas day... you know, those dinki wee pastries and bikkies you get in fancy restaurants after dinner. I'll be teaming these up with mini versions of my Lemon & White Chocolate Cupcakes, some mini chocolate muffins, again from The Pink Whisk, and some Chocolate Shots served in little shots glasses using my Chocolate Cheesecake recipe minus the biscuit base. There is nothing to stop you experimenting with these and adding some real shots into the mix with Bailey's or Butterscotch Mickey Finn's. All of these miniature desserts also make great party food, just serve them on a cake stand with teaspoons beside the Chocolate Shots.